Microscope World Blog: What are Backlit CMOS Sensor Microscopy Cameras? What are Backlit CMOS Sensor Microscopy Cameras? Typically there have been two image sensors used in microscopy cameras: CCD and CMOS. The CCD (Charge Coupled Device) sensor historically created less noise, but these were also more expensive than CMOS sensors. CMOS (Complimentary Metal Oxide Semi-conductor) sensors are camera sensors that are constructed on one large piece of silicon to include electronic circuitry for controlling the sensor by mounting them on the surface of the silicon instead of being contained in a separate circuit. A back-illuminated or backlit CMOS sensor is different from a traditional CMOS sensor in that all the wiring and circuitry used to carry electronic signals from each pixel is located at the back of the sensor instead of on the front. By moving this circuitry to the back of the sensor more light is able to reach each pixel, which results in the backlit CMOS sensor being able to record images in lower light and with less digital noise. Digital noise in photos typically results in photos with more fuzz, especially in low light. 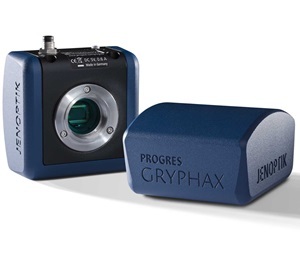 View a chart comparing all the Jenoptik microscopy cameras here. Contact Microscope World with questions regarding microscopy cameras and sensors.